Written by Lungs’ Duncan MacMillan and Johnny Donahoe, Every Brilliant Thing tells the story of a little girl who chronicles all the little things that make life brilliant. It’s an uplifting story of a young girl trying her best to keep it together, filled with laughter, tears, and introspection about the depth of living. 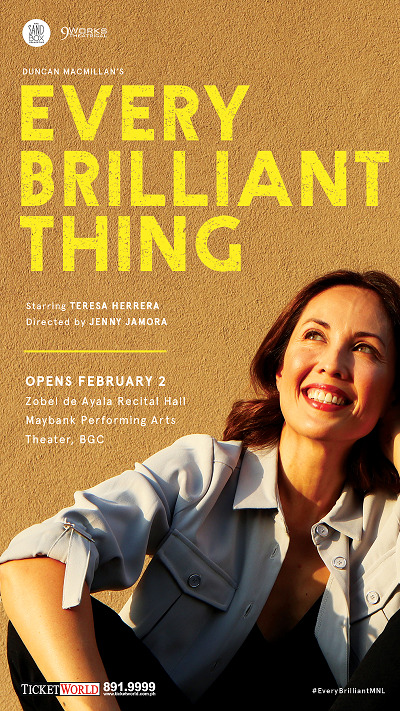 KAKKI TEODORO will star in the following shows: Feb 9 & 23, 2019 | Sat | 2:30pm. To purchase tickets please call TicketWorld at +632-891-9999.